“After being Christians for over 50 years, we consider the insights in this book to be some of the most life-changing issues we have encountered since our new birth.” Chuck & Nancy Missler. What is an overcomer? Why is it so important to learn this? What are the practical steps to becoming an overcomer? What will overcomers inherit and what could be lost? What are the two kinds of inheritance described in Scripture? What is “Justification”, “Sanctification”, and “Glorification”? Why are our actions now so critically important to our future? What are the consequences of an unfaithful, carnal lifestyle? How are we able to “walk by faith”? What should we expect in the Millenium? 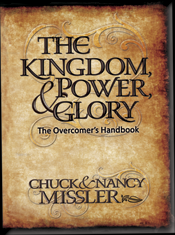 The Kingdom, Power & Glory is truly a handbook for believers because it joins together the theological aspects of Scripture with the practical instruction to experience the truth. While this is an exciting book, it is very important to come to it with an open mind as described in Acts 17:11, “They received the Word with all readiness of mind, yet they searched the scriptures daily to prove whether these things be so.” This is especially true when our presuppositions could interfere with a truly open re-examination of certain Scriptures. Two-page, color fold-out chart of the entire “Kingdom Perspective”. The counsel contained in this remarkable volume will explain what the life of faith is intended by its Author to lead to, which is divinely ordered preparation for rulership in the coming Kingdom. For those who are in the midst of that certain and inevitable God-ordained discomfort called adversity, The Kingdom, Power and Glory is just what you’ll need to make sense out of a world turned upside down. I love the “Kingdom, Power & Glory”. I bought the CD at the Strategic conference last weekend and listened to the first 4 sessions from Couer d’Alene to Seattle. How can I get the charts mentioned in the CD. Are they in the book or study guide. I hope sometime in the future to share this in our women’s bible study. We’re currently on “Teach us to pray” by one of our own in the church. I continue to pray for you & Chuck. You both have been such a blessing for many years. I am on chapter 4 of kingdom, power and glory and I find myself thinking, “I have to hurry up and get my work done so I can get back to this book. I might learn something more I need to work on before the rapture. Thanks again for your work. I have just begun reading this book and want everyone that I know to read it.